It’s probably one of the questions that patients ask the most, when considering a hair transplant: “Will it be painful?” At RHRLI, we hear this all the time, and we certainly understand why it’s such an important consideration. That’s why RHRLI wants to make certain that all of our patients looking for a permanent solution to hair loss know that our hair transplant procedure is minimally invasive. The ARTAS® system transplant is what’s called a Follicular Unit Extraction (FUE) procedure that uses robotic technology. 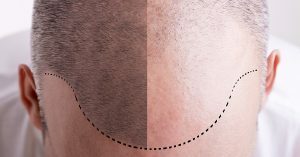 FUE is not to be confused with Follicular Unit Transplantation (FUT) another type of procedure, commonly called strip surgery. In a video produced by RHRLI, our doctor, Baiju Gohill explained the critical differences. Strip surgery “essentially requires the surgeon to use a scalpel and remove an area of the scalp in the back of the head to harvest donor hair,” Dr. Gohil says. But this leads to a longer recovery period after the patient is sewn up. “The patient will be left with a scar and a post-procedure period of significant pain that typically requires narcotics to recover,” according to Dr. Gohil. It’s a very different story when you have a procedure with the ARTAS System. According to the ARTAS® website, the transplant is minimally invasive because each individual hair is targeted with robotic precision. This is the reason why ARTAS® is preferable to other FUE procedures which use handheld devices that can cause fatigue or over-harvesting of hair. When you’re finished with the ARTAS® procedure, the difference in recovery from strip surgery patients is striking. There won’t be a scar and your hair will retain its natural appearance. Because their is no scarring, you won’t have to worry about the effects of heavy pain medication. Most patients are prescribed acetaminophen. Strip surgery can leave longer recovery times, up to several weeks and patients often have difficulty sleeping in the areas where the surgery was performed because of the sutures. ARTAS® patients are normally back to work and back to normal activities within a few days. Our patients sleep more comfortably without pain the night following the procedure. RHRLI and ARTAS® offer a permanent solution to hair loss with the least amount of pain and the least amount of recovery time. And we’re the only hair loss restoration center on Long Island that offers ARTAS®. We can change your life with a minimum of discomfort. For more information, contact RHRLI today.